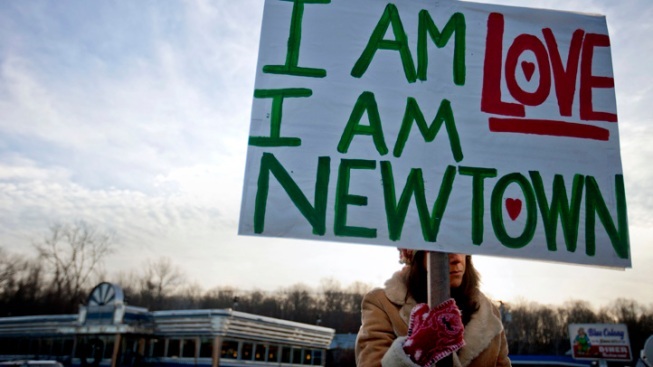 School officials are also readying counselors for the first day of classes since a shooting massacre in Conn.
A Newtown, Conn. resident sits at an intersection holding a sign for passing motorists up the road from the Sandy Hook Elementary School. Schools around the country are reviewing security plans, adding extra law enforcement patrols and readying counselors for the first day of classes since a shooting massacre at an elementary school in Connecticut. Districts from Alabama to Arizona and Florida to New England were asking local law enforcement to increase patrols on Monday. School officials in some areas sent messages to parents addressing security or stressing that they have safety plans that are regularly tested. While some officials refuse to discuss plans in detail, it was clear that vigilance will be high this week at schools around the country. Additional police patrols are planned this week in northern Virginia around the Fairfax County Public Schools, which is the largest school system in the Washington area with 181,000 students. Counselors will also be available at all schools. "This is not in response to any specific threat but rather a police initiative to enhance safety and security around the schools and to help alleviate the understandably high levels of anxiety," Superintendent Jack Dale said Sunday. Those sentiments were echoed to the South in Florida's Hillsborough Co., where Sheriff's office spokesman Larry McKinnon said unmarked and marked cars will patrol the schools along with deputies in plain clothes. He wouldn't say how many extra officers will be involved. The additional patrols will supplement deputies already assigned to every high school and junior high school in the area to ease the fears of parents "who may feel uneasy about sending their children to school." The county's public school system in the Tampa area includes around 195,000 students. The precautions come after a gunman shot his way into Sandy Hook Elementary School in Newtown, Conn., on Friday and killed 26 people before shooting himself. The dead include 20 children ages 6 and 7. Aside from their students' physical safety, administrators were also concerned about the psychological toll of the shootings. In Maryland's suburbs outside Washington, Montgomery County Public Schools will have counselors available at each school Monday to support the system's 149,000 students. Chief of Staff Brian Edwards said officials posted advice online from the National Association of School Psychologists on Friday to help parents talk about acts of violence. "Obviously, this is a very difficult situation that all school communities are dealing with and the entire nation is dealing with," Edwards said, adding that the system doesn't discuss security procedures. "You can't change what occurred, but you try to do the best you can to help families cope." In Tucson, Ariz., where a January 2011 mass shooting killed six and wounded U.S. Rep. Gabrielle Giffords and 12 others, the largest school district increased security after Friday's shooting. Tucson Unified School District spokeswoman Cara Rene said Sunday that the district was participating in a memorial being held at one of its schools on Sunday evening, with Gifford's replacement, Rep. Ron Barber, a featured speaker along with Superintendent John Pedicone. Barber was with Giffords at the constituent meet-and-greet and was among the wounded. Rene said planning was under way to help teachers and students with grief and fear issues when school resumes Monday, and the district was working with Tucson police on security issues. At Deer Valley Unified School District in suburban Phoenix, one of the state's largest, a spokeswoman said teachers were given direction on how to answer students' questions and a message to parents was posted on the district's website emphasizing the district's security policies. Spokeswoman Heidi Vega said no extra security or counseling was planned. Officials in South Carolina's largest school district sent a note to parents Friday ensuring they have safety plans that are regularly tested for a number of possible events. Officials refused to details their plans, saying that would threaten the safety of its more than 70,000 students. Just last week, before the school shooting in Connecticut, Greenville County schools Superintendent W. Burke Royster said the school system met with members from every law enforcement agency in the county to review what to do in an emergency, and make sure they can all communicate. The meetings take place frequently, and the next round will likely involve any lessons that can be taken from the latest school shooting. "While all of us work diligently to prevent this type of tragedy and to prepare an effective response to all manner of possible events, we do so in the hope that our plans will never have to be utilized," Royster wrote in his note. Milton Kuykendall, the superintendent of the Desoto County School District, the biggest in Mississippi with 32,769 students, said he called for an evaluation of his schools' security policies and procedures immediately after the shootings in Connecticut. Kuykendall said the district already evaluates the schools' security every year, but he decided to start that process now rather than waiting until later in the school year. He also plans on Monday to remind principals throughout the district to be "on high alert." Students begin Christmas break on Wednesday. "We're going to do whatever it takes to keep our students safe," Kuykendall said.